Bjørn Kjos, known for his colourful personality and enthusiastic entrepreneurial spirit, is often described as Norway’s answer to Richard Branson. He has recently made waves for pioneering a business model that successfully operates long-haul flights across the Atlantic at rock-bottom prices. 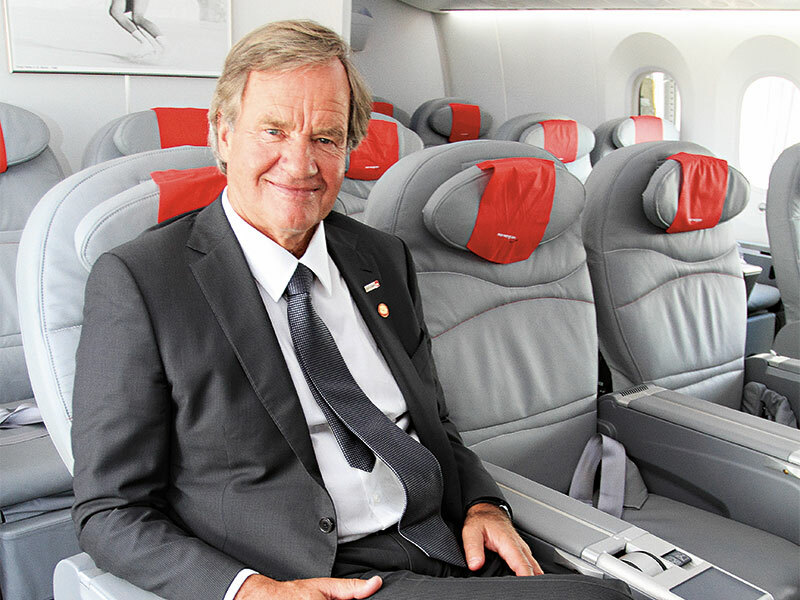 While Kjos’ entry into the low-cost, long-haul market has attracted a great deal of attention over the past few years, the scale of this ambition it is nothing new for Kjos, who has led Norwegian Air Shuttle through rapid expansion right from the start of his tenure. He has held the role of CEO for 15 years, during which time he has transformed the airline from a small-scale domestic carrier to the international player that it is today. Going back to Norwegian’s modest beginnings, Kjos has always fully embraced the low-frill, low-cost market. Talking to European CEO, he said the company vision is to create “affordable fares for all”. Indeed, he has already made substantial headway towards this goal, having expanded the company’s reach first into Scandinavia, then into Europe, and now towards the US, Asia and Latin America. When he took on the role of CEO in 2002, passenger numbers per month were well below 100,000; the airline now carries almost three million passengers over the course of an ordinary month. While aviation has held a lifelong fascination for Kjos, his career trajectory has taken a roundabout route to bring him to the commercial airline industry. “Aviation has always played a central part of my life; flying has been a great interest of mine since I was a child because my father owned a small aeroplane”, Kjos said. “I trained to become a fighter pilot and worked in the Norwegian Royal Air Force from 1969 to 1975; this experience has no doubt been valuable for me as CEO of Norwegian.” During his time with the Air Force, he piloted the famously dangerous Lockheed F-104 Starfighter, patrolling Norway’s airspace and intercepting Russian jets at the height of the Cold War. After serving as a fighter pilot, however, Kjos found himself unable to secure a job with Scandinavian Airlines, which at the time was not recruiting new pilots. Instead, he turned his efforts to law, choosing to retrain at the University of Oslo. He then spent a two-decade stint as a lawyer, during which time he served as a judge in Moss District Court and took on Supreme Court cases. According to Kjos, this experience in the field of law is something he continues to draw upon in his role as CEO at Norwegian. On top of his experience as a fighter pilot and lawyer, Kjos has tried his hand at writing. During his spare time, he wrote Cold War crime thriller The Murmansk Affair, which was published in 2006. More recently, he penned a non-fiction book that he described as “the story of Norwegian”, in which he documented the battles he fought when growing the company in its early years. While the business model for budget airlines has been wildly successful for short-haul flights over the past two decades, it has largely proved unsuccessful when applied to long-haul trips. When Kjos launched Norwegian’s budget Atlantic flights in 2014, the venture was met with cynicism from many in the industry, who questioned whether the concept would prove commercially viable. Fast forward to the present, however, and talk of Kjos’ business model has made its way into White House press briefings, and several aviation giants are gearing up to follow suit. Notably, Kjos was not the first to attempt to offer rock-bottom prices for long-haul flights. Many tried and failed before him, including Ryanair’s Freddie Laker, who attempted to run budget Atlantic flights in the 70s before declaring the venture a failure just five years later. Other attempts included Canada’s Zoom Airlines and the Hong Kong Express, which similarly ground to a halt after just a few years. At the heart of Norwegian’s success has been the new generation of fuel-efficient aircraft. “New, fuel-efficient aircraft are a win-win for customers, the environment and the company’s costs”, explained Kjos. Indeed, the Boeing Dreamliner 787 – the jet which forms the bulk of Norwegian’s long-haul fleet – can run on around 20 percent less fuel than others in the market, and as such is able to bring down the fuel costs that form a substantial chunk of an airline’s outgoings. A state-of-the-art plane such as the Dreamliner 787, however, comes with a heavy price tag, and is not the only key to Norwegian’s success in the long-haul market. “It is essential to the low-cost model to have a low-cost operation”, said aviation expert John Strickland. “Only a few airlines have managed this successfully so far, and Norwegian has had to go further than others. Kjos has had to be more creative and innovative to find other ways to reduce costs.” For example, Kjos has fought many bureaucratic battles in order to establish bases outside Scandinavia, allowing the company to access cheaper international labour. Now Kjos has proven the no-frill, long-haul concept can work, he is speedily expanding Norwegian’s fleet. The company’s order book for new jets is piling up: as well as the 130 aircraft that currently make up the fleet, it has an additional 250 on order. “We made one of the biggest aircraft orders in European history”, said Kjos. “We boast one of the world’s youngest and greenest fleets, with an average age of just 3.6 years.” Overall, Norwegian’s capacity is scheduled to grow by 30 percent over the course of this year. Over recent months, Kjos has been busy launching new routes for Norwegian’s fast-growing long-haul fleet. He is currently in the process of launching new transatlantic routes from Europe, as well as expanding into Asia and Argentina. However, according to Strickland, finding new markets to support such rapid expansion could prove challenging. “The London market to the US is one of the biggest in the world, so you can easily fill a plane on such routes, but other markets will require more work to deliver profitability”, Strickland explained. “The jury is out at the moment over how many markets of this kind Norwegian will be able to find to turn into flourishing, long-term, sustainable, profitable routes.” Further to this, industry experts predict rapid expansion carries the risk of weighing on unit costs as a result of the associated training, recruitment and marketing costs. What’s more, this is by no means the only challenge facing Norwegian in the future. The company’s success in introducing budget long-haul flights has prompted a flurry of imitators across the industry. Close to home, Scandinavian Airlines is looking to follow in Norwegian’s footsteps in acquiring an Irish licence that will enable it to base its crew in the UK and Spain. Furthermore, competition is beginning to heat up from other big players. “IAG is founding a whole new long-haul, low-cost operating platform in Barcelona to counter the strategic threat from Norwegian growing there, while in London, BA has opened new B777 routes to JFK, Oakland and Fort Lauderdale, flying wingtip-to-wingtip against Norwegian on these routes”, according to an HSBC industry research pubication. For Kjos, however, competition is no reason to tone down Norwegian’s rate of growth. He argues both expansion and scale are crucial to the company’s sustainability: “Without the expansion, we wouldn’t be able to survive with the fierce competition we’re facing today. Opening new routes all over the world and offering low fares to new customers is important”, he said. Overly ambitious, perhaps, but judged on his past experience, Kjos certainly has a knack for tapping into new markets and judging when the timing is right.